The inspirational blind and deaf activist and educator Helen Keller learned to speak aloud, but, to her great regret, never clearly. Her careful penmanship, above, is another matter. Her impeccably rendered upright hand puts that of a great many sighted people—not all of them physicians—to shame. Some of these systems had their basis in the Roman alphabet, including Boston Line Type, the brainchild of Perkins’ Founding Director, Samuel Gridley Howe, an opponent of Braille. Students may have preferred dot-based systems for taking notes and writing letters, but Boston Line Type remained Perkins’ approved printing system until 1908. Perkins has published a Flickr album of letters Keller wrote between the ages of 8 and 11 to then-director Michael Anagnos, including 3 pages in French. Leafing through them, I marveled less at her ability and determination than my (sighted) 16-year-old son’s lack of interest in developing a respectable-looking hand. If you go to Roumania, please ask the good queen Elizabeth about her little invalid brother and tell her that I am very sorry that her darling little girl died. I should like to send a kiss to Vittorio, the little prince of Naples, but teacher says she is afraid you will not remember so many messages. Browse Perkins’ collection of Keller’s handwritten letters to Michael Anagnos here. Ayun Halliday is an author, illustrator, theater maker and winemaker who played Annie Sullivan in her high school’s production of The Miracle Worker. Follow her @AyunHalliday. 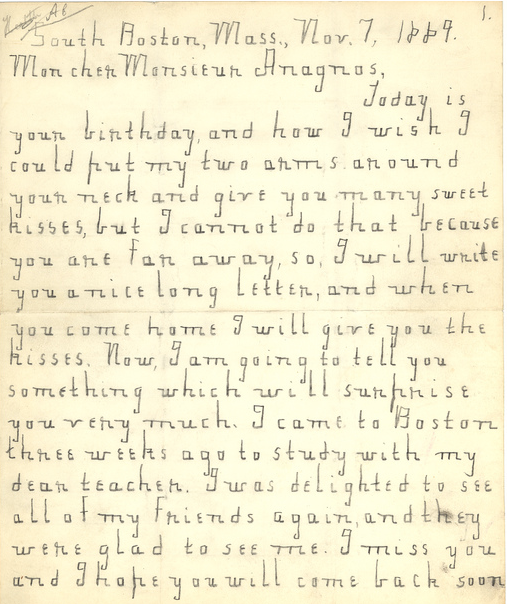 Helen Keller Had Impeccable Handwriting: See a Collection of Her Childhood Letters is a post from: Open Culture. Follow us on Facebook, Twitter, and Google Plus, or get our Daily Email. And don’t miss our big collections of Free Online Courses, Free Online Movies, Free eBooks, Free Audio Books, Free Foreign Language Lessons, and MOOCs.